The following is a post by Allison Kellum, Americorps Natural History and Volunteer Educator. Listen to Allison discuss the squid dissection with Nan Evans on KPTZ's Nature Now. Living on the edge of the Salish Sea, we only see the periphery of the vast and complex diversity in our local waters. On rare occasions, we get the special opportunity to be up close and personal with extraordinary creatures of the cold, watery vastness. Through our close relationship with the local officials at the Washington Department of Fish and Wildlife (WDFW), the Port Townsend Marine Science Center (PTMSC) received a fisherman’s donation of a large squid specimen for use in our education programs. I was privileged to lead this unique experience with our other staff for 15 exuberant summer campers and a dozen inquisitive onlookers. We didn’t have enough space in our specimens freezer to house the squid, so a hand-off had to be arranged the week of camp to get the squid to PTMSC from the WDFW freezer. A large 20 gallon black tub housed the iceblock containing the squid as it thawed in our Discovery Lab over the course of three days. Luckily, decomposition had been minimal before being frozen, so this was one of the less smelly specimens we’ve dealt with this year. Our normal classroom tables were ill-suited for the size and juiciness of the specimen, so our Marine Mammal Stranding Network necropsy table was brought up to the Pier, along with a scale, large buckets, clear plastic cups, towels, and a couple of pairs of sharp dissection scissors. Our summer campers had been honing their observation and inquiry skills all week long in our brand new “Marine Biology Afoot and Afloat” camp. The squid dissection was the final activity of the week, and students were eager to show off what they’d learned ...and to get a little messy. I set the foundation for the large dissection by spending an hour leading the students through dissecting their very own 15 cm long market squid. They sketched the external anatomy, labels and everything, then *snip-snip* opened up their squid to explore the various organs and search for the three hard parts (beak, pen, and lens). We sped through a quick classroom clean-up to join the growing group of onlookers outside for the large specimen dissection. With many bodies in a small space, I introduced students to our tools: necropsy table, buckets, step-stools, and a cart holding dissection tools. The squid was weighed, with it’s surrounding liquid, in the 20-gallon bucket . The squid was lifted onto the table, and then the bucket and liquid were weighed again without the squid. The squid weight was determined by subtracting the second weight from the first. tentacles, fins, siphon), then flipped the squid over to make dissection easier (the whole class helped with this!). We took some time to pass around pieces of the skin and pen. I invited students to help hold the measuring tape and read off dimensions so that our other AmeriCorps, Ashleigh Pilkerton, and a handful of campers could record them on the data sheet. Students “drum-rolled” on the edge of the necropsy table while I cut up the center of the ventral (siphon) side of the mantle. While we talked about parts of the larger squid we used a check-list on the data sheet to quiz students on what they’d just learned about the anatomy of their small squids . Highlights included: finding the stomach, stomach contents, and spiral caeca; removing the beak; and finding the ganglia and large axons. Since this was a dissection with summer campers, I wanted this to be different from the marine mammal necropsies we do for our Stranding Network Program. Our main goals were: have fun, practice scientific skills of inquiry, collect enough data to identify the species, and inspect the stomach contents. Keeping these goals in mind, I let go of some precision in data collection to be a little messier with the process. As staff, I felt extremely lucky to share this dissection with such curious, engaged, and helpful students. They were incredibly hands on - to the point where there were times I had to ask that the students stop touching the specimen! The small squids were kept for feeding to PTMSC animals in the Marine Exhibit, but without enough freezer space, the remains of the large squid were broken down and disposed of. Some pieces were taken back by a WDFW staff member, many pieces were thrown back into the Salish Sea, but the pen, beak, and stomach contents were saved for future education programs and to help with species identification. Having the dissection outside sped clean-up immensely. One of my personal goals for this dissection was to open up the experience to members of the public who were visiting our exhibits, or just walking around our Pier. To facilitate this I used rope to cordon off an outside mini-classroom area on the North side of our Marine Exhibit building. In addition to being in public view this allowed for: ventilation, shade, and easy access to the classroom. I invited other PTMSC staff to view the dissection and help answer visitor questions so that my team could focus on the squid and summer campers. I brought out a whiteboard with a diagram of basic squid anatomy and I made an additional sign that described the activity, while also requesting people stay behind the rope. This helped to both inform the public and establish boundaries for the dissection area. I want to preface this section by saying that I am a marine biology generalist and educator, not a squid biologist. This specimen was brought in with a tentative identification as a Humboldt Squid (Dosidicus gigas). WDFW asked that, as part of the dissection, we make a conclusive species identification. Unfortunately, with the tight camp schedule, a positive id was not made during the dissection. Despite this, I was able to use our data sheet, pictures, and the pen to help me identify the species in the week following the dissection. Various identification resources online show pictures of sharply toothed suction cups on the arms of D. gigas and that the apex of the pen (gladius) is spoon shaped. These two characteristics were not present on our specimen. Our suction cups lacked teeth and the apex of the pen was circular in cross-section. These two differences lead me to believe that the specimen was possibly a Robust Clubhook Squid (Onykia robusta), more common to the North Pacific. One of the key features of the Clubhook Squid is the presence of longitudinal ridges along the length of the mantle. We were missing much of the epidermis on our specimen, but a review of photographs from the dissection show indications that this may have been present on the intact parts of the skin. I am looking forward to sharing these thoughts with a squid specialist to confirm a species id. ...to the anonymous fisherman for our specimen, Washington Department Fish and Wildlife, and PTMSC Summer Camp campers. ...to PTMSC staff: Ashleigh Pilkerton, Chrissy McLean, Nancy Israel, Amber Heasley, and Alison Riley (for her photography). To see the keys used for identification and to view photos of the stomach contents, read the full report. Set Sail on the Adventuress September 5! Join the Port Townsend Marine Science Center on a September 5 sail aboard the Adventuress with naturalist Roger Risley! Reserve your spot at cruises@ptmsc.org. The PTMSC offers one 6-hour sailing adventure each year to the Protection Island National Wildlife Refuge aboard the 101' historic schooner, Adventuress. On this cruise, you can help the crew sail this historic vessel while enjoying a leisurely tour of the wildlife sanctuary. As on all our cruises, Port Townsend Marine Science Center Naturalist Roger Risley, will be onboard to assist in wildlife spotting and interpretation. The sail departs at 12 pm on September 5 from the Northwest Maritime Center dock at the north end of Water St. in Port Townsend and returns to the dock at 6 pm. Tickets for the Protection Island Sail are $80 per person or $75 for members of PTMSC, Audubon, Burke Museum, or Washington Ornithological Society. 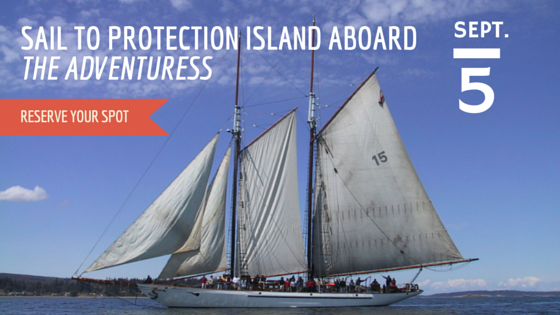 For more information on the Protection Island Sail, or to reserve your spot, email cruises@ptmsc.org.